London Corporate Cabs Wedding Taxis are traditional London Black Cabs. Immaculately presented, elegantly decorated with white ribbons and bows or flowers to add that final touch. All of our Wedding Taxis are the latest models, with no adverts and a full chrome trim, they really stand out from the crowd. 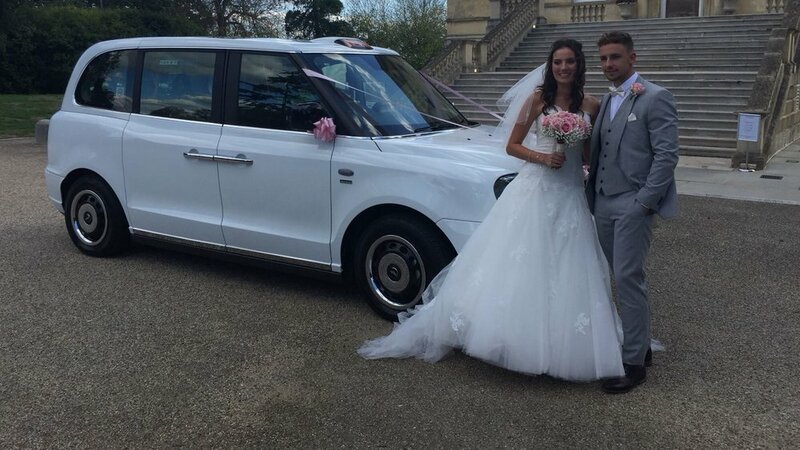 Spacious and private inside for the bride and father, with room in a second wedding taxi for up to 5 bridesmaids it's the perfect bridal transport and a fantastic way to arrive at your special day. Being so spacious we can also accommodate your photographer in the taxi to capture some great pictures along the journey. With a strong focus on professionalism we pride ourselves on the very high standards we set ourselves. Reliable, friendly and providing a first class Wedding Taxi service. From the moment of booking your Wedding Taxi we make sure we do everything possible to make this part of your Wedding day go as smoothly as possible. While some Wedding Cars can be quite expensive our Wedding Taxis are competitively priced but with the professional and friendly service you deserve. Booking a Taxi for your Wedding is simple, fill out our Wedding quotation form, we’ll need the date of hire, collection time, duration of hire and where the wedding will take place then we can provide you with a quote. Each Wedding is priced individually to suit your specification. Our Wedding Taxis always arrive a minimum of 15 minutes before the booked time at no extra charge to ensure they are ready and waiting for a prompt departure. 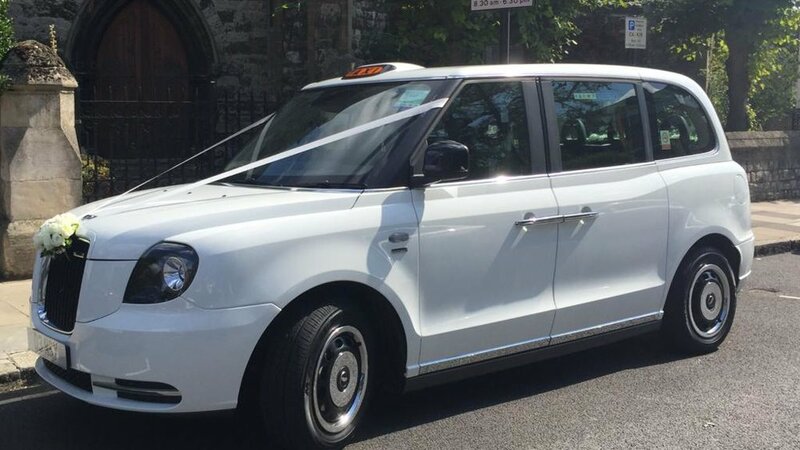 Once the Wedding ceremony is over our Wedding Taxis will be waiting to take you onto your reception but there is no rush, let your guests admire you and your Wedding Taxi or have some photos taken. Once at your reception venue the driver can wait while you have photos or if you wish you can stop off en route to your reception at a desired location for private photos with just you and your partner. Traditionally 2 Wedding Taxis are booked, 1 for the Bridesmaids and Mother of the Bride and 1 for the Bride and her father, in addition to this we can also provide a Black Cab for the Groom, Best man and ushers. I just wanted to say thank you for organising the taxis for Friday – all of our guests were so impressed and just loved the experience – so thank you! I love the classic London black cabs and wanted to make sure I travelled to my wedding ceremony in one that didn’t have a massive ad emblazoned all over it. London Corporate Cabs sorted out three cars at short notice and at a reasonable price. Ross, Gary and Warren turned up early and got 2 of the cabs to the venue on time and the last car (which I was in) left later to ensure that the bride was just late enough to make the groom nervous. Would definitely recommend, so thanks again. Your support of my little project has been invaluable. We could not have met and talked to so many inspiring women and men today without Ross, his cab, his excellent driving, incredible timing and his patience. Lloyd and I are absolutely shattered (in a good way). Today has been a great success and we will be editing, uploading, promoting and sharing the photos, audio and video over the next few days. Watch this space as they say. Thank you and Ross for the hard work and making this element of the day go off so well. Many of our guests loved the cab as our wedding car - it was in keeping with our “travel” themed wedding day and there are number of lovely photos of it from our photographer. Ross was very well turned out on the day and great to have drive us around. I cannot fault Tony and the team for providing such a professional and friendly service at a far more competitive rate than other firms for wedding transport. The cars were beautiful and Tony made every effort to ensure our day went smoothly. A great big thank you to Tony and the Team. Thank you for making our day so special. You were completely reliable and you made sure that there was fantastic communication throughout. Just a little message to say thank you for everything on the 30th - you guys are fantastic and were so calming on such an exciting day! Thank you for your services the other week at our wedding the other week. Your knowledge and insight into good photo spots around the area was very impressive. Thank you for your contribution to our special day. We just wanted to drop you a note to say how thrilled we were with your service on Saturday - very professional, punctual and calming! You helped to contribute to our perfect day and we wanted to say a huge thank you! Just wanted to say a massive thank you for making our day so special yesterday. The cabs were perfect and you were wonderful. We just wanted to write and say a huge thank you for Saturday. We would not hesitate to recommend you! Liam and I wanted to send a big thank you for the wonderful cabs provided on our wedding day. Please do thank the drivers for everything and getting us to the venue safe and sound. Sharon and I would like to say a very special thank you for your assistance these past months and providing us with such a wonderful support in preparation for our wedding. Thank you to the two gentlemen who were very accommodating on the day. The cabs looked wonderful and we felt like a million dollars when we walked out of The Waldorf Hotel to our waiting cab with a silver ribbon to finish it off! Even with the traffic problems and the rain that day, they ensured that we had our ‘photo shoot moment’ near St Paul’s, kept us dry holding their umbrellas over us getting in and out the cabs and got us to the venue in good time, so please pass on our thanks to them from both of us and our witnesses. We will happily recommend your services to all of our friends! Thank you once again for making our wedding day so special. Please note: We are not just a pick up and drop off wedding car hire service. While our wedding taxis are working vehicles, when booked for a wedding they are taken off the road for full valeting. Every care and attention is taken to make sure they arrive on your special day in immaculate condition.